We evolve. We solve problems. New problems pop up. That’s the natural order of things. Not in the NFL. The NFL evolves, but the same old problems continue to exist. America’s most popular and competitive sport remains at the mercy of the game officials. Too often bad calls and no-calls determine the outcome of games. That was the case in the NFC Championship. The trophy went to the Rams; it belongs to the Saints. 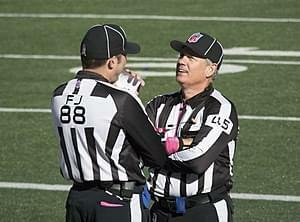 On what should have been a simple pass interference call, the officials swallowed their whistles. How could that happen? Now, what can be done about it? You’ll hear a lot of arguments on that because this story won’t die. Review everything in the final two minutes? Will that make the game too long? Would any NFL fan stop watching if games were five minutes longer? Maybe give coaches an extra challenge in the final minutes? Sadly, this is an old story. Jaguars fans only have to go back to last year’s AFC title game to feel the Saints’ pain. Mariano Rivera was a great closer, the greatest in Major League history. A slam-dunk Hall of Famer. No argument there. But the first player to get 100 percent of the votes? That gives the impression to some he was the greatest player ever – and there you’ll get an argument from me. Obviously, there are quite a few players who deserved 100 percent of the votes – Ruth, Cobb, Aaron, Williams, Griffey Jr., DiMaggio, Mantle . . . stop me, I could keep going – but for years that wasn’t the way it was done. I’m old school and growing up no player got in the Hall his first year, much less get every vote. The thinking was voting for 1st-year-eligible players was saved for the very best of all-time. After the first year of the Hall in 1936, no first-year player was voted in until ‘62, 26 years. Mistakes were made — Ted Williams, Stan Musial and Joe DiMaggio, to name three – but few noticed. The great players were going to get in the Hall, but that first year was . . . well, that was something really special, saved for Mount Rushmore-kind of players.